We cannot deny the importance of mehndi on the auspicious events. All weddings and Eid functions are incomplete without Mehndi. Best Stylo is presenting New Arabic Mehndi Designs 2018 for hands and feet. However, Nowadays, Arabic Mehndi designs are very much popular because of the modern look. Arabic Mehndi designs are famous because of the intricate designs, which surely makes your hands, and feet look more appealing. They are well known for exquisite as well as for beauty. Arabic Mehndi has considered one of the popular types of Mehndi art used all across the world. The standard Arabic Mehndi designs do include peacocks mehndi designs, flowers, swirls, veils or even the geometrical shapes. After being inspired by Arabic Mehndi Designs, you can easily find local adaptations of Arabic Mehndi Designs since they incredibly catch the attention of Asian women too. To look good in your desi attire, Hands and Feet without Arabic Mehndi design will not do justice with your appearance. Therefore, are you preparing yourself for a wedding or upcoming Eid, then you must be finding New Arabic Mehndi Designs 2018 for Hands and Feet. We have gathered the best and amazing designs for the convenience so that you can select and apply them accordingly. Let’s see, which New Arabic Mehndi Designs are popular in 2018 so that you can surely consider this time while getting ready for the function. If you are a mehndi lover then surely these Arabic Mehndi Designs are going to attract you, and you will surely look forward to applying these designs. Traditional designs are very detailed and are easy to incorporate and join with additional beautification materials, which include sparklers, stones, and gems. You can easily try these at home or go to a parlour for professional mehndi application. The most necessary and the most wanted jewel for each woman is ‘Mehndi.’ Just like other accessories, every girl mainly makes use of it for all sort of occasions like wedding functions, mehndi ceremonies, traditional get-together, Eid festivals and other related events. A woman wants to look different on the special occasions, and that is why there prefer to apply mehndi in a unique pattern. Even the Easy and Simple Arabic designs are chic and very appealing. Mehndi is some fun or art for every female. Mostly dark brown and black hues are employed in these patterns, which enrich the magnificence and charm of entire art. then following back side of the palm is having a light floral design. Fingers are completely full of mehndi design. To attain the following pattern, grab the mehndi cone and paint your hands in brown Arabic mehndi. This is one of the beautiful and fresh patterns. Try this easy method to get fantastic design. Wear this design to the party to make it appear germane to the environment. You can use glitter gel and specks to add innovation. Similarly, you can take a look at our collected Latest Glitter Mehndi Designs Collection You can also use rhinestones over it to stay stylish with the amazing new subtle pattern. For occasions such as festivities and weddings, it is must activity to decorate your feet with Mehndi. Endeavor this funky mehndi design on your friend’s wedding as it is full of shimmers and looks thrilling. It is the most suitable for joyful events because of the intricate and intense pattern. Only things you ought to have a henna cone and glitter gels of many shades. Use silver stickers and glitter gel to get this as a result. Are you more into Floral Mehndi? Visit our page Top lovely floral mehndi designs for hands feet. The design below is a perfect combination of fine and bold patterns, which does look easy to follow but needs a lot of practice to create such a distinct look. Grab a henna cone and start doodling on your feet. Expert or professional can give you such a fantastic look because it covers the entire feet and is known as the spread out designs. Pakistani style of Mehndi does include underlying patterns, which gives glamorous as well as traditional touch to your appearance. Use dark brown henna cones that are easily available in the market to draw perfect bracelet design on wrists. This design will give a pleasant and refreshing sight to the viewer. You can also use silver glitters for shading as an innovation. If you do not want to go for the elaborated or the intense design, then Arabic tikka designs are always everyone’s favorite. They are perfect for every occasion and suits every type of personality. It surely stands out the feet or hands. A combination of petals and tikka is preeminent to wear, more than that; they are easy to draw at home. Try this elegant Arabic design as it is simple to have on and quite an effortless. You can combine them with floral patterns and tendrils to make the design more impressive. The most popular amongst all in Mehndi Designs- Glittered Arabic Mehndi Designs that is worn by the Bridal mostly. The rhinestones and sparkles of different colors are superlative and appropriate to wear for any occasion on this mehndi design. You can also try this with arms or can change the pattern to any desirable design. Stick the rhinestones, and it’s all done! The dash of glitter and stones will add a sweet twinkle. If you are searching the Arabic mehndi designs for Eid 2018, this one is probably the superlative one for any occasion. This Arabic henna art is easy to follow. If you think yourself as a diva who wants to grab the event attention, then this design will surely be alluring for everyone. All you have to do is to spread your magic on your feet. Do not forget to match the Mehndi design with a great outfit for the best look. Try this detailed thin Arabic henna print with the contrast of brown and black henna cone. The brown and white sparkling iotas are so easily obtainable so try to form this design. These designs are fuss-free and ideal for every age group. It is easy to manage and leave you without worrying about the stubborn henna stains. You will get the best design! 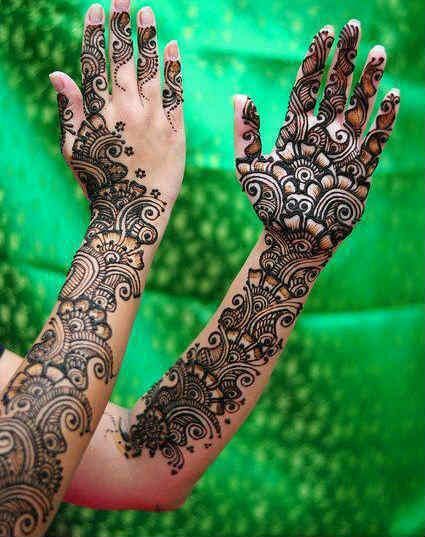 It is not necessary to only wear black henna on your hands and feet. You can wear it on by adding a bit of pink and white glitters and stones. Moreover, give finishing with the help of small stones that appears surprising indeed. Make sure to combine the color and stones in sequence. Do you want to see more of shaded designs? check out Best Shaded Design which will enhance hand appearance. Extend or make additions to a bling effect instead of going out of your look. You can get this aesthetic and magical Arabic print on your feet very quickly. All you need is a simple brown henna cone and small rhinestones along with a stroke of pink glitter gel. The pattern will look beautiful on every sort of occasions. It may seem time-consuming, but it is just a work of minutes for a professional. You can add variations according to your need. Elaborate designs are not appealing to every type of occasions. It is best to change your style simple and overwhelming with the simple Net Pattern. It will hardly take some minutes. You can mold a simple net design into such mesmerizing, captivating and enthralling net pattern design that looks amazing. You can get this at your friend’s wedding and even on Eid occasions. Artistic Arabic mehndi design is ready to be decorated on your feet. It is simple in style with the touch of black Arabic henna on feet. The good thing about them is that you can comfortably make it without rushing towards salons! Draw flowers and petals using black henna or any other shade you desire which matches your outfit. If you are searching for brilliant and latest Arabic mehndi designs 2018, this one is probably the superlative one for you. All you have to do is to make the following design along with glitters and rhinestones over it. It is perfect to make you a stunning bridesmaid and looks wonderful for all age of women. Indian Mehndi Designs are very intricate and intense. They do include Rajasthani touch. The professional designs include peacock, human figures, and symmetrical patterns. Endeavor this beautiful and mesmerizing mehndi pattern on your big day. Kick the bucket of old mainstream mehndi arts on your wedding day and ask the mehndi artist for this design. If you are one of the people who love Indian Style Mehndi then this pattern will truly stand out your looks. Young girls always try to adopt or search unique mehndi designs to look extremely different from each other. Right now, I have gathered huge series of some of my favorite design which you can gracefully apply to both hands and feet. Hope that you will like this excellent Arabic Mehndi designs 2018 for Hands and Feet. So, must try these fabulous designs shown below and make your event more special and memorable!! Have a look for more and do not forget to share your views and ideas with by commenting.